Check back here monthly, during the academic year, to read about what topics your student is working with in his/her Spanish class. -All homework assignments are posted on my web site and updated daily. Simply click on the desired class title in the top menu to see the assignments for that class. -I have also created a page that contains my e-mail address and phone number. I invite you to contact me whenever you have questions or concerns about your student's class or his/her progress in it. Click on "Contact Me" in the menu at the top of this page for my e-mail address and phone number. We continue to work with the grammar (verbs, adjectives, object pronouns etc. ), as well as working on our fifth unit: Films and writing (the film trailers are at the bottom of this webpage). 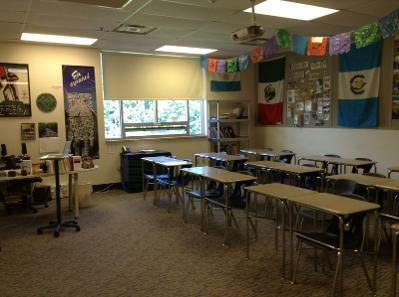 The students are also continuing to reflect on the cultures and history of Spanish Latin America. Of course, everything we do in class continues to be in the Spanish language. The students also continue to enjoy the Mexican telenovela, "La madrastra" ("The Stepmother"). The students have finished their unit and grammar work, and are now focusing on practice tests and test-taking skills. Specifically, we have been doing intensive practice with simulated conversations and writing persuasive essays. The students are also still enjoying the Mexican telenovela, "La madrastra" ("The Stepmother"), when our class schedule allows it. 1. "Living On One Dollar"
Where will your student's interests take him/her? Click HERE to get some ideas!